Past President Karen Kestenbaum remembers her freshman year when she first decided to live at Chabad House. 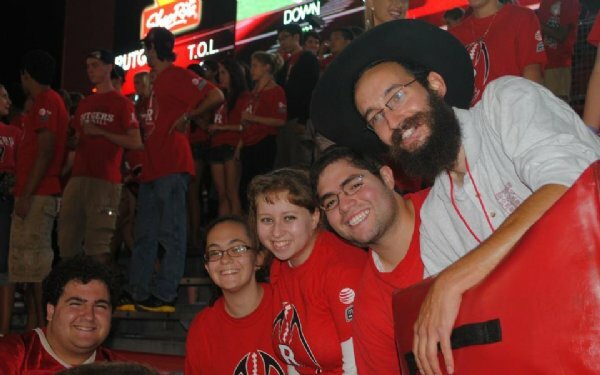 After visiting the regular Rutgers dorms, her parents stopped by the Chabad dormitory. “They were pleasantly surprised,” says Kestenbaum. “Compared to the Rutgers dorms, Chabad’s housing was downright palatial.” Still, Karen was concerned about whether she’d feel at home living in the Chabad House. Rebekah Loewenstein, a past dorm resident, didn’t discover Chabad House until after attending Rutgers for her freshman year. 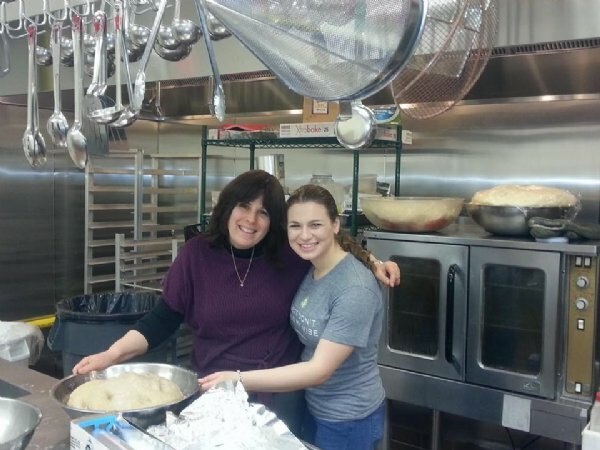 After attending one of Chabad’s weekly Friday night dinners, following months of procrastination, Rebekah instantly realized she would somehow have to get more involved with Chabad. The first step she took was signing up to live at Chabad House. “I signed up as fast as I could,” Loewenstein remembers. Rebekah’s involvement with Chabad House ultimately stemmed from her initial decision to make Chabad House her home. As time passed, she became increasingly involved, attending weekly meetings, helping out at Tuesday night socials, and making sure to never miss a Friday night dinner. Eventually, she became so involved that she went on to the leadership position of co-Vice President. During the formative college years, students need a living environment that can help them become secure in their identity. 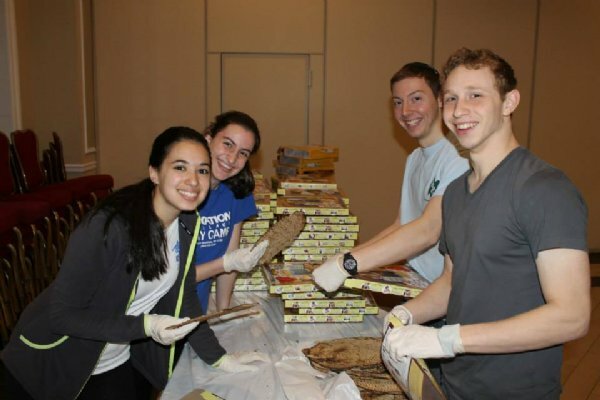 Chabad House is proud to provide just that for all Jewish college men and women seeking to live in an open and tolerant, yet unquestionably Jewish environment. Students residing at Chabad House build bonds that last a lifetime and friendships that remain solid years after graduation. 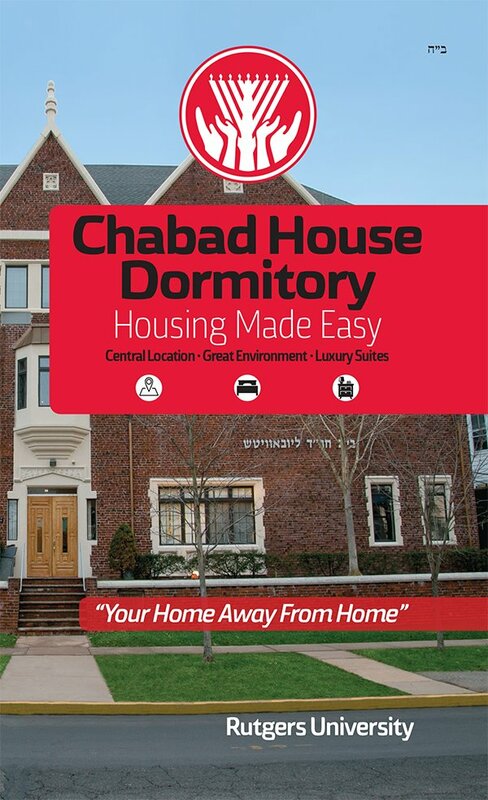 There are many advantages of living at Chabad House beyond the one-of-a-kind environment it provides its residents. Availability of housing on or near Rutgers’ Campus is very limited and students are often housed far from the campus center. 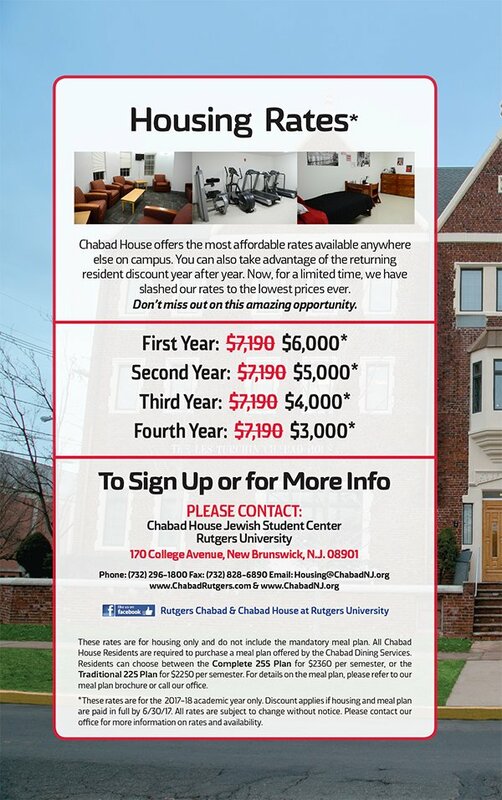 Situated at 170 College Avenue, Chabad House is ideally located in the heart of Rutgers’ bustling campus, directly across from Alexander Library, Brower Commons, and the Rutgers Gym. This 90,000 sq. ft. facility is also home to a Sephardic synagogue, a first ever on an American college campus, and an International Coffee House. In addition, living at Chabad House means that the Kosher Dining Hall is just steps away, a convenience especially appreciated by residents during the chilly winter months. Additionally, Chabad House is located just two blocks from a beautiful park, allowing a quick and quiet retreat amidst the bustle of College Avenue. 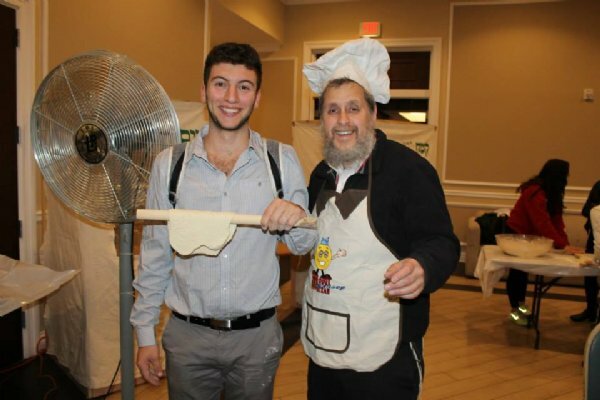 There are other valuable benefits that are part and parcel of life at Chabad House. The Goodman family moves in each and every Shabbos and Jewish holiday, meaning that the residents get to experience the beauty of Shabbos spent with a large family. Over the course of an entire year together, the members of Chabad House become a surrogate family of sorts, and Chabad House their home away from home. This, too, adds an extra dimension to Shabbos and holidays that would be impossible to experience living anywhere else. Aside from the warm fuzziness of living among family, the material benefits are significant as well. Some of the luxurious amenities of living in the residence include beautifully furnished suites, ultra-modern rooms, private baths, individually regulated heating and air-conditioning, a student cafeteria serving three kosher meals daily, full laundry facilities, elevator service, social halls, spacious student lounges and quiet study areas. Campus and local bus service is available at the front curb, providing easy access to all campus facilities, train stations and three major shopping malls nearby. 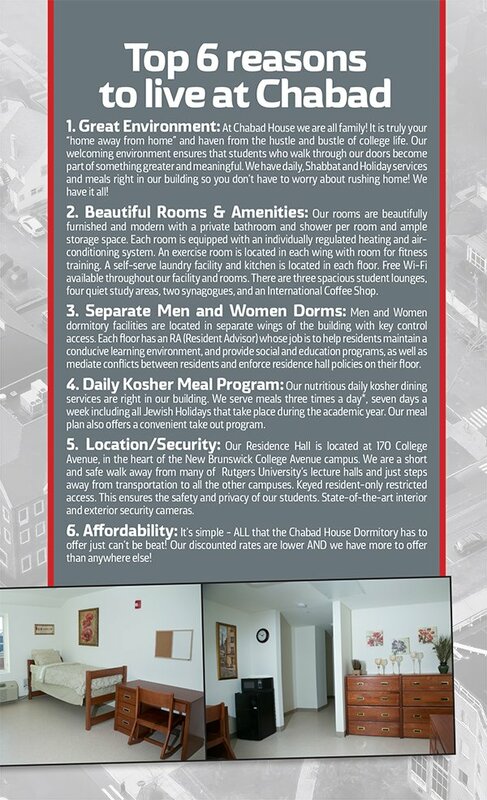 Both the women’s and men’s dormitories at Chabad House share many features in common including a workout gym, lounges, laundry room, and much more. Jeff Schwartz, a former student, added, "now that I've gotten used to the university, and have seen first-hand the awesomely spectacular events and programs that Chabad House offers each day, I am very looking forward to moving into the new Chabad dorm and having the chance to participate more fully than before, having lived in a regular dorm my first year." 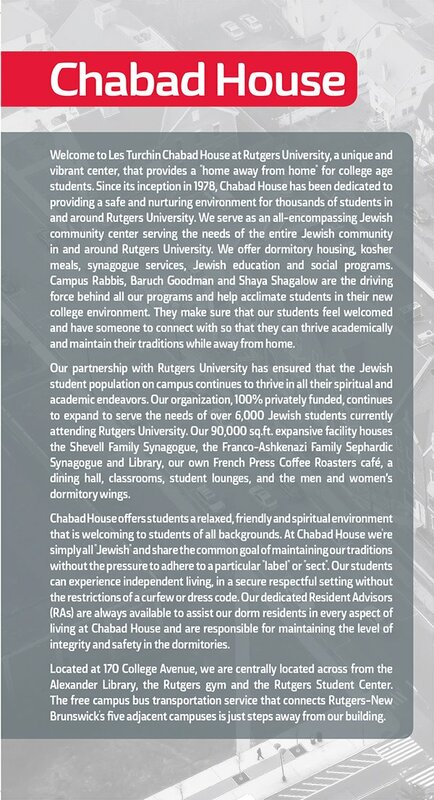 What is clear is Chabad’s role in changing the entire nature of Jewish dormitory life on the American college campus.